The Grand Theft Auto series of games have always made some interesting use of technology. Be it either the radio stations played in cars when a player is cruising around or the mobile phones used by the lead character, there is always something to enjoy. Now you can mash your love of Grand Theft Auto 5 with your fondness for the iPhone after the two were thrown together in unholy matrimony. 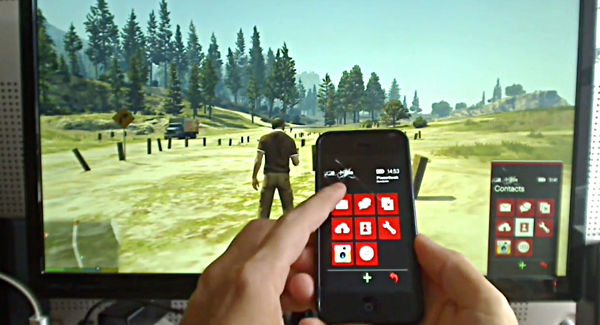 Have you ever wished that you could interact with the GTA 5 in-game smartphone using your own iPhone? Of course you have, and we have too. Importantly though, so had Reddit user plantleak because he set about making his dream come true. Now, after some hacking and general magic wielding, it’s possible to take an iPhone and use it to control the in-game character’s smartphone as if you were in the game yourself. In order to make all this work, plantleak had to creat an iPhone app using Apple’s Xcode and then have it use gestures and buttons to send special URLs to an Arduino server. That server then sends inputs the the PC version of Grand Theft Auto via a keybinding macro with the result likely to blow your mind. There’s a YouTube video for those who don’t believe this is possible, and while it’s not something that you can just download and do for yourself in the comfort of your own home it’s still pretty awesome to see it even work at all. Hats off to you, sir. Is being able to use your iPhone to partly control a Grand Theft Auto game something that will set the world alight? Of course not, but the fact that it is possible and that someone has taken the time to implement it is simply awesome. Imagine what will be next. See Patrick. Even people who believe in the PCMasterRace know that iPhone is legend. They were going to create an android one but what happens was it sent a virus to his game and his entire PC blew up.